An artist's impression of NASA's Parker Solar probe, which will launch in the summer of 2018. For the first time, a NASA spacecraft will swoop in and touch the sun. The Parker Solar Probe will make 24 orbits of the star before swooping into the outermost part of the solar atmosphere, known as the corona, to study the sun up close and personal. At its closest approach, Parker Solar probe will fly within 3.7 million miles (6 million kilometers) of the sun's surface — more than eight times closer than any other spacecraft and more than eight times closer than Mercury. The probe launched on Aug. 11, 2018, from Cape Canaveral, Florida. It will study how heat and energy move through the corona and explore what accelerates the solar winds that affect Earth and other planets. The probe is named after Eugene Parker, who first hypothesized that high-speed matter and magnetism constantly escaped the sun, and that it affected the planets and space throughout our solar system. This phenomenon is now known as the solar wind. NASA Is About to Launch the Fastest Spacecraft in History. Target: The Sun! Why Is NASA Launching the Parker Solar Probe to the Sun at Night? 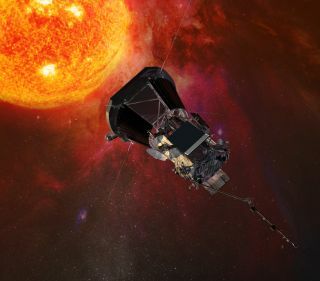 "Parker Solar Probe is going to answer questions about solar physics that we've puzzled over for more than six decades," Parker Solar Probe Project scientist Nicola Fox of the Johns Hopkins University Applied Physics Laboratory, said in a statement. "It's a spacecraft loaded with technological breakthroughs that will solve many of the largest mysteries about our star, including finding out why the sun's corona is so much hotter than its surface. And we're very proud to be able to carry Gene's name with us on this amazing voyage of discovery." The sun is the primary source of Earth's light and heat, but that's not the only way it affects the planet. The solar wind is a collection of charged particles that stream from the star and flow past Earth at speeds of more than a million mph (400 kilometers per second), according to NASA. Disturbances in the solar wind can shake our planet's magnetic field and pump energy into the radiation belts, triggering a set of changes known as space weather. Space weather can affect satellites, changing their orbits, interfering with their electronics, or shortening their lifetimes. Understanding how the solar wind and space weather works can help protect these valuable assets. "Until we can explain what is going on up close to the sun, we will not be able to accurately predict space weather effects that can cause havoc at Earth," says the John Hopkins University Applied Physics Laboratory Parker Solar Probe website. Earth isn't the only planet affected the solar wind. As far out as Pluto, the worlds in the solar system are affected by the flow of charged particles. With its almost non-existent atmosphere, Mars is particularly vulnerable. Already, astronauts aboard the International Space Station must shield themselves from the effects of the solar wind. Understanding the environment affected by the solar wind is crucial as humans look to explore the moon, Mars and deep space. Originally known as Solar Probe+ (pronounced Solar Probe Plus), the Parker Solar Probe seeks to solve two outstanding mysteries of the sun's atmosphere. The first involves the corona, where temperatures are higher than those found at the surface of the sun, a process that seems to break the laws of nature, Fox said. She compared the sun to a campfire, but as you walk away from the fire, you feel hotter rather than cooler. The high temperature remains a mystery more than 60 years after it was first measured. The second mystery involves the solar wind. The fast, hot wind blows charged particles, but its origin remains unknown. There is no organized wind close to the sun's surface, but by the time it hits Earth, the wind blows incredibly fast. Somewhere between, an unknown agent accelerates the wind. Scientists hope that the new mission will help identify the driving force. "To solve these mysteries, Solar Probe+ will actually enter the corona," program scientist Lika Guhathakurta of NASA Headquarters said in a 2008 statement. "That's where the action is." The Solar Wind Electrons Alphas and Protons Investigation (SWEAP) will specifically count the most abundant particles in the solar wind, measuring the properties electrons, protons, and helium ions. The Wide-field Imager for Solar Probe Plus (WISPR) is a telescope that will make three-dimensional images of the sun's corona and inner heliosphere to actually "see" the solar wind and provide 3-D images of shocks and other structures as they travel by the spacecraft. The Electromagnetic Fields Investigation (FIELDS) will make direct measurements of the shock waves that course through the sun's atmospheric plasma. The Parker Solar Probe will arrive at the sun in November, spending seven years studying the star from 3.7 million miles (6 million km) away. Mercury, the closest planet to the sun, only gets as close as 29 million miles (47 million km) in its highly eccentric orbit. The spacecraft will make 24 orbits around the sun, using Venus to make seven gravity assists. "Our solar arrays are going to operate in an extreme environment that other missions have never operated in before," Johns Hopkins Applied Physics Lab's Mary Kae Lockwood, spacecraft system engineer for Parker Solar Probe, said in a statement. These temperatures would prove dangerous to conventional arrays that have flown on other missions, so new technology was required. The mission relies on a first-of-its-kind actively cooled solar array system. But before the spacecraft reaches the sun, it will have to travel through the freezing temperatures of space. "One of the biggest challenges in testing this is those transitions from very cold to very hot in a short period of time," Lockwood said. It turns out that pressurized water makes the best coolant for the instruments when the spacecraft reaches the sun. Because the probe will first have to travel through the freezing temperatures of space before reaching the broiling solar environment, any coolant would need to operate between 50 F (10 C) and 257 F (125 C), and few liquids can handle that range like water. Pressurizing the water raises its boiling point. "For the temperature range we required, and for the mass constraints, water was the solution," Lockwood said. After launch, temperature swings will impact the water. First, the temperatures of the solar arrays and cooling system radiators will drop down as low as minus 220 F (minus 140 C) before they can be warmed by the sun. Less than an hour later, the spacecraft will separate from the launch vehicle and begin a complex post-separation sequence in which the probe rotates several times and water flows from the heated accumulator tank into the two of the radiators and power charges the batteries. When the spacecraft reaches the sun, it will need to make further adjustments, without the help of engineers on the ground. It takes light — and radio signals — about eight minutes to travel from the sun to Earth. That means that the complex adjustments the spacecraft needs to undergo to protect itself will be done autonomously. New software will help the spacecraft to instantly alter its pointing to maximize protection from the sun. "During solar encounters, very small changes in the wing angle of the solar array can vastly change cooling capacity needed." Lockwood said that a one-degree change in the array angle of one wing would require 35 percent more cooling capacity. "This is all new," she said. In the 1950s, Parker, an astrophysicist and professor emeritus at the University of Chicago, proposed a number of concepts about how stars — including our sun — give off energy. He described an entire complex system of plasmas, magnetic fields and magnetic particles that make up what he referred to as the solar wind, the cascade of energy streaming from the sun. Originally, the mission was billed as the Solar Probe Plus. But in 2017, only a few days before the scientist's 90th birthday, NASA renamed the mission to honor Parker for his contributions. "This is the first time NASA has named a spacecraft for a living individual," Thomas Zurbuchen, associate administrator for NASA's Science Mission Directorate in Washington, said in a statement. "It's a testament to the importance of his body of work, founding a new field of science that also inspired my own research and many important science questions NASA continues to study and further understand every day. I'm very excited to be personally involved honoring a great man and his unprecedented legacy." Most NASA missions are renamed after their launch and certification. However, in this case, the decision was made to honor Parker before the launch, in order to draw attention to his important contributions to heliophysics and space science. Originally proposed in 1958, the mission has been a long time in coming, "not because we weren't excited," Fox told reporters, "but because we had to wait 60 years for technology to catch up with our dreams." "The solar probe is going to a region of space that has never been explored before," said Parker. "It's very exciting that we'll finally get a look. One would like to have some more detailed measurements of what's going on in the solar wind. I'm sure that there will be some surprises. There always are."